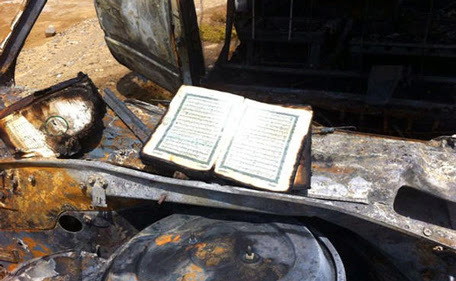 A copy of the Quran emerged intact when all other contents of a car were destroyed in a fire that charred the vehicle in Saudi Arabia. Its owner was driving in the southern Saudi province of Jazan when the car suddenly caught fire, prompting him to jump out. 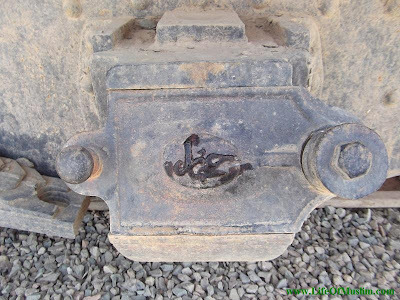 A Saudi man who was driving in that area rushed to the man to help him out before noticing that only a Quran copy remained intact after all other contents were wiped out. “The driver told me that the car belongs to his father who always kept a copy of the Quran in it. “When I looked into the charred car, I was stunned to see that everything was destroyed except the Quran, which remained intact. “I decided to document this miracle with pictures by my mobile phone,” he told Sabq daily. 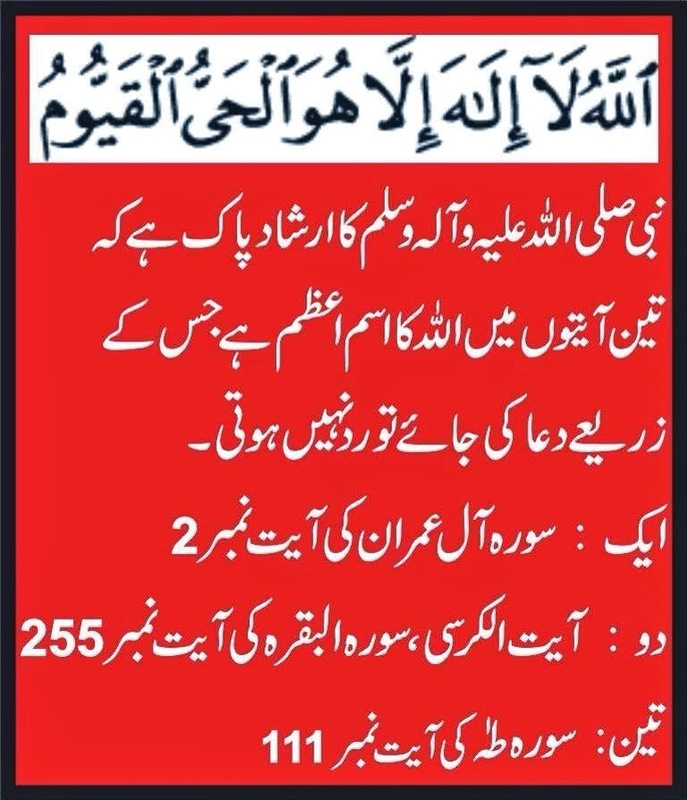 3 Aayato'n mein ALLAH ka Ism-e-Azam hai, jis ke zariye Dua mangi jaye to radd nai hoti. 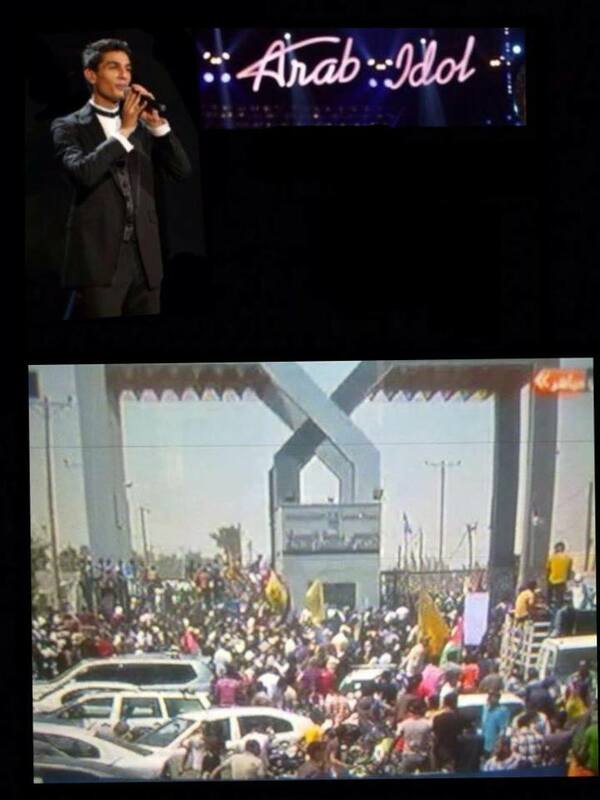 Thousands of Palestinian people waiting for a singer !!!!!!! Like he is Salahuddin Alayubi coming to free their occupied land! When the great leader Salahuddin Alayubi was asked: Oh Salahuddin, why do you never smile? He said: How can I smile and how can food or water taste good to me when Al Aqsa is under the hands of the occupiers?! 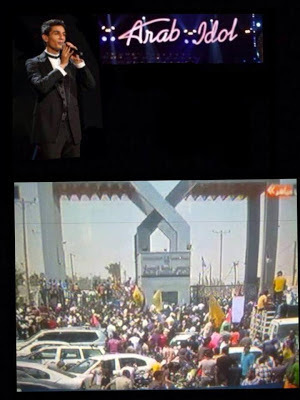 Today, "israel" succeeded to turn the hearts of muslims toward songs and love series so you find millions of muslims spending their days watching turkish series and western movies reading about singers and football players while other muslims are being slaughtered like sheeps and their lands are being occupied ! The prophet pbuh said: , 'Soon a time will come upon you, when the nations will call one another against you, like a group of people sitting around a platter of food. He (saw) replied." No, you wont be few in number, rather you will number MANY...BUT you will be like the floating rubbish, upon floods of water. Allah the almighty says: "Believers are but brothers"
How dare a muslim enjoy his life while his brother muslim is being killed ?! How dare a muslim sing while he knows that his sisters are being raped somewhere else ?! How dare a muslim feel happy while he knows that Alquds is under occupation of non muslims ?! Brotherhood is gone , may Allah save us. 1) It change every year on Zill Hajj. 2) It’s value is about 200 Million Saudi Riyal. 3) It’s weight is up to 670 Kg. 4) 150 Kg Pure Gold & Silver used on it. 5) It is build up with 47 parts. 6) Every part is 14m Horizontal&95cm Vertical. 7) Round 4 hours required for change it. 8) It is made with Pure Re sham Stuff. Philippines Actress Queenie Padilla has quit show business for her Muslim religion. In an interview with ABS-CBN News, Padilla said she finds inner peace and direction in life in Islam. Representatives of Yahoo India Pvt Ltd and Microsoft told the court that they had not got copies of the order and complaint against them, but Qasmi's counsel told the court that he would supply the relevant documents to them, according to the Hindustan Times. Indian legendary Bollywood superstar Amitabh Bachchan is reading the Islamic holy book, the Quran, nowadays. Amitabh Bachchan’s extended twitter family suggested him to read the holy Quran. “A member of TwFmXt here asked me to read the Koran, for peace and tranquility, for the essence of life.. I did..” Amitabh revealed on his Twitter page. The superstar even quoted a few verses from the holy book. “God changes not what is in a people, until they change what is in themselves ” Koran ( 7th century ), Sura 13, v. 11” wrote the 69-year-old actor. He later added another verse “Walk not on the earth exultantly, for thou canst not cleave the earth, neither shalt thou reach to the mountains in height- Koran. However, when someone pointed out that the spelling of the holy book should be Quran, Amitabh Bachchan did not hesitate to apologize. “Correction: QURAN and not KORAN!… however the book I was reading from had it as KORAN so I mentioned it so..apologies! !” the superstar wrote. 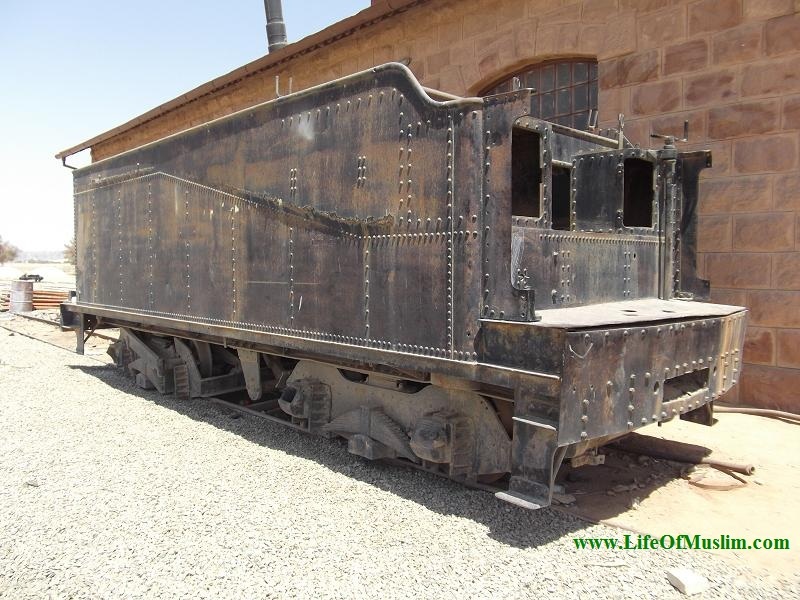 The Hejaz Railway (also spelled Hedjaz) was a 1050mm gauge railway originally built to transport pilgrims from the city of Damascus in Syria to the city of Madina in Saudi Arabia. It was completed in 1908, but was severely damaged during the First World War (1914-1918) by Lawrence of Arabia and the Arab Revolt. 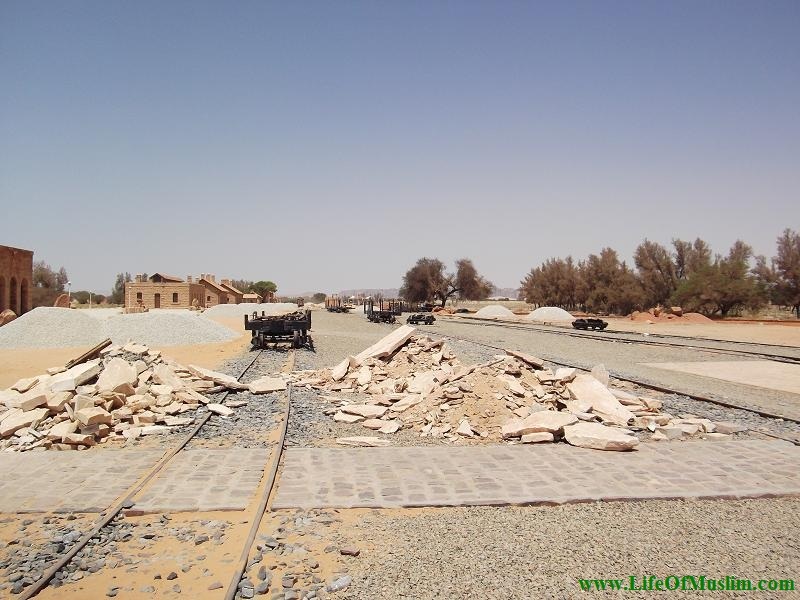 Parts of the Hejaz Railway survived and some of the sections are still functioning today. 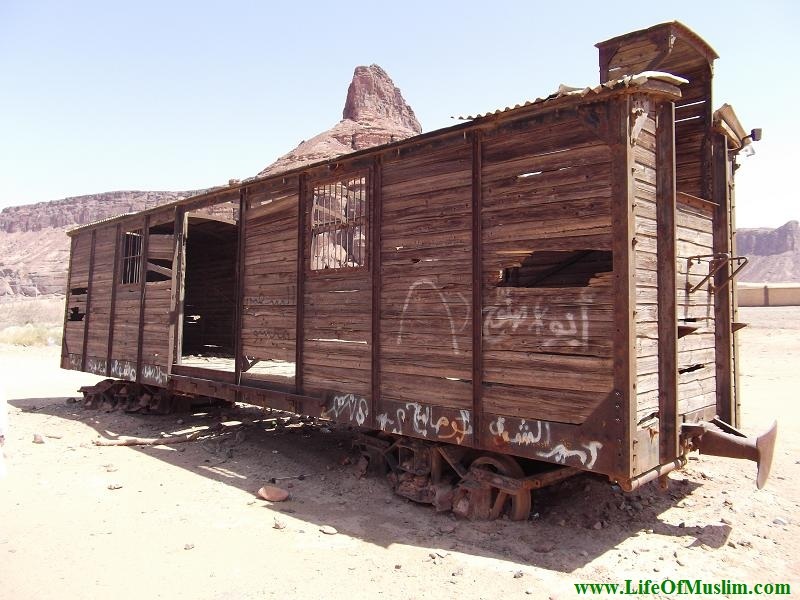 On June 5, 1916, the Hejaz railway line was cut by Lawrence of Arabia. This single-track line ran all the way to Madina, linking the Arab countries with Europe and following the Red Sea coast. 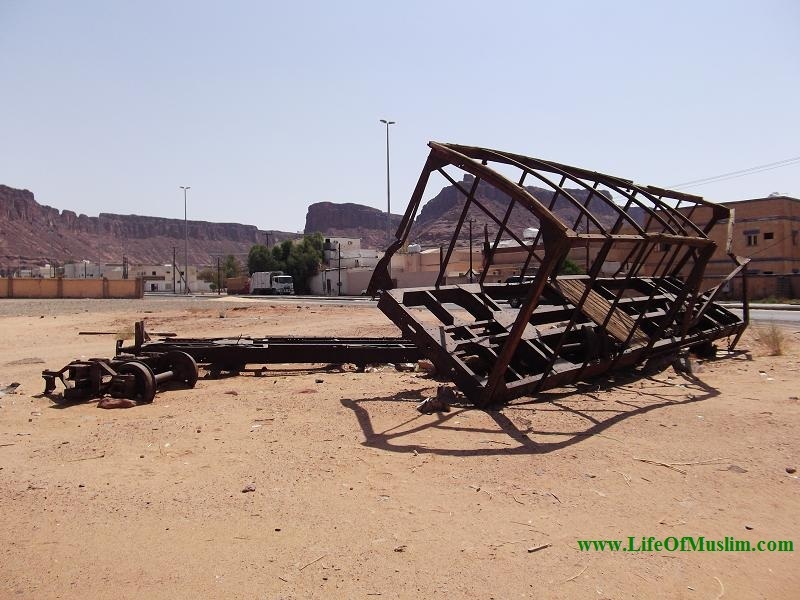 It carried Muslim pilgrims to the holy cities of Mecca and Madina. Its quaint but attractive stations can still be seen today by curious travellers. It was built by the Turkish (Ottoman) Caliph Abdul Hammed-II. He gave 6,000 soldiers under the command of a German engineer to work day and night on the project which started in 1900 and was completed in 1908. The section from Baghdad, Aleppo, Damascus (Danishiq), Derra, Amman, Akaba, Madina and Mecca was given the name of the Hejaz railway. The other section from Baghdad, Constantinople and Berlin was the Berlin-Baghdad railway. T.E. Lawrence, on an archaeological trip, had brushed by the German engineers at Carchemish while building the Berlin-Baghdad railway. And he was the man given the task by the British to prepare the Arab revolt against the Turkish overlords. The British instigated Arabs to start their own national movement, which would be beneficial to them to weaken the Ottoman Empire. As in nationalist movements elsewhere, there was a revived interest in the past. Particularly in the distant time when Arab civilization was the greatest in the world. Societies to further Arab interests were formed of which the most influential was the young Arab society, Al-Fatah. The Arab nationalist movement was centred in Syria and the Lebanon, not in the Arabian peninsula, but at the suggestions of the British embassy in Constantinople, the Turks had appointed Hussain Ibn Ali as the grand sharif of Mecca. This Arab nationalism was carried into the lands of Arabia as Hussain and his four sons were Arab nationalists. Abdullah, who later became king of Jordan, was a member of a secret Arab revolutionary society and Faisal, the later king of Iraq, became a member of Al-Fatah. The Hashmites were indeed a remarkable family of ambitious nationalists. In the spring of 1914, when Abdullah sought an interview with the famous British representative of Cairo, Kitchener of Khartoum, he had said: “If at anytime there is anything I can do for you, please let me know.” That help was called for in 1916, and came in the form of money and ammunition and, of course, Lawrence of Arabia. The European powers were already intriguing in the Middle East, principally Britain with her imperial concerns and France with her long-standing connections with Syria. The Jews were ready to grab Palestine. With Turkey now at war, the best hope for the success for Britain and France lay in an immediate attack upon the Dardanelles through which lay the route to Istanbul, the Turkish capital. Churchill wanted an immediate attack on Gallipoli, as this plan would cut off the Hejaz railway running from Allepo to Madina — the threat to the Suez Canal and Egypt. Allied forces must have had suffered heavy loss as their first attack was repulsed by the forces with causalities running as high as 200,000. Next came the severing of the Hejaz railway line by Lawrence of Arabia with the help of Arab guerrillas. Lawrence himself describes what happened in one such action in Sept 1917, at Mudawwara, north of Akaba: “At that moment, the engines, looking very big, rocked with screaming whistles into view round the bend. Behind them followed 10 box-wagons, with rifle-muzzles at the windows and doors, and in little sand-bag nests on the roofs. The Turks precariously held on to shoot at us. I had not thought of two engines, and on the moment decided to fire the charge under the second, so that however little the mine’s effect, the uninjured engine should not be able to drag the carriages away. “Accordingly, when the “front” driver or the second engine was on the bridge, I raised my hand to Salem (Faisal’s best slave). There followed a terrific roar, and the line vanished from right behind a spouting column of black dust and smoke a hundred feet high and wide. Out of the darkness came chattering crashes and long, loud metallic clanging of ripped steel, with many lumps of iron and plate; one entire wheel of a locomotive whirled up suddenly and sailed musically over our heads to fall slowly and heavily into the desert behind. Except for the flight of these, there succeeded a deathly silence, with no cry of men or rifle shot. I ran down to the ruins to see what the mine had done. The bridge was gone; and into its gap was fallen the front wagon, which had been filled with the sick. The smash had killed all but three or four and had rolled the dead and dying into a bleeding heap against the splintered end. 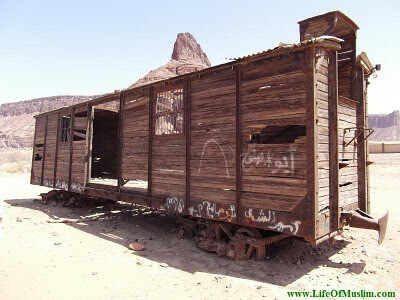 Since then, many efforts had been made to repair and restart the Hejaz railway but all have failed. 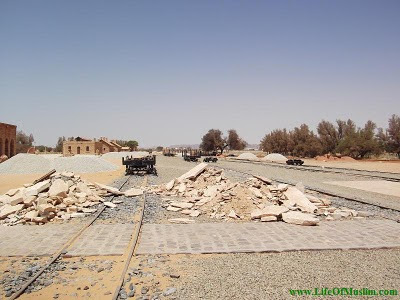 In 1938, the King of Saudi Arabia, Abdul Aziz Bin Saud, at the time of Haj, donated $25,000 in the hope that from year, the railway would start work, but the western companies deceived him. Then, in 1946, when Syria and Jordan won freedom, efforts were again made but to no avail. In 1955, Shah Saud of Saudi Arabia contracted a New York firm, Irex, but the contract failed. Again, a 12-member committee was formed which gave the contract to a Poland firm which brought in pro-Israel Jews who indulged in subversive activities and were turned out by the Saudi Government. 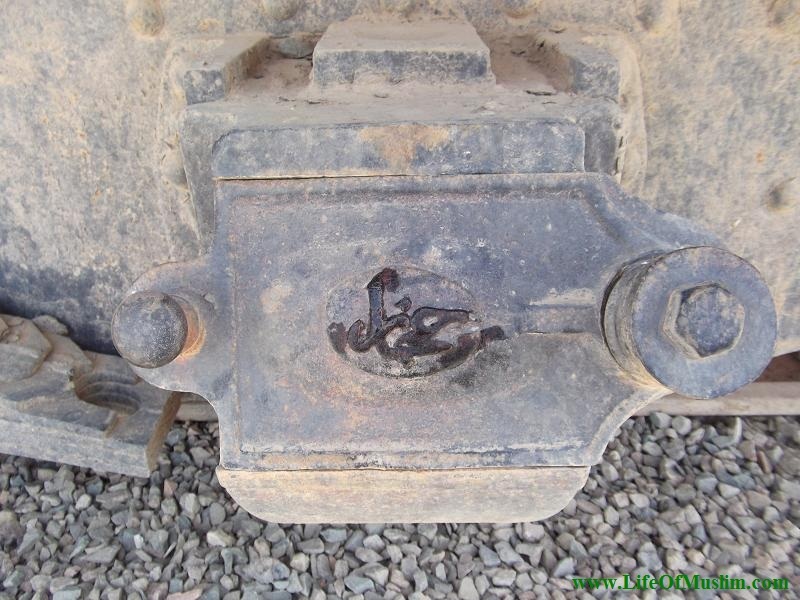 During 1967 and the Arab-Israel war, the Hejaz railway line and its bridges were again damaged. DOHA: A total of 800 expatriates converted to Islam in the last six months, according to statistical data released by Qatar Guest Centre (QGC). The Centre, which is affiliated to Sheikh Eid bin Mohammad Al Thani Charity, is planning to publish the stories of these converts in a book to be translated in other languages. Also, QGC is organising in Al Khor advocacy programmes to educate the new Muslims in cooperation with religious guidance and mosque affairs department and Ministry of Awqf and Islmaic Affairs. Of the 800 new Muslims 67 percent are Filipinos, according to Hadi Al Dosari, Director of Qatar Guest Centre. In its four years of service to Islam and the Muslims, the Centre has been contributing to the promotion of Islam with the number of new converts from various nationalities reaching 919 last year, said Al Dosari. He said the number of converts to Islam has been increasing steadily for the last years. 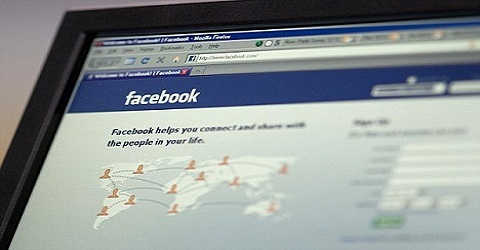 From 21 new converts monthly in year 2006, the numbers increased to 28 in 2007, 46 in 2008, 52 in 2009 52 and 77 last year. “These numbers reflect the efforts of the Centre to bring the message to all the communities,” he said. The Centre is also organising cultural activities which attract a lot of people through lectures, seminars and meetings with various expatriate communities. A total of 2, 470 lectures which deal with various aspects of life has already been organised by QGC and its tent at the Karwa bus station attracts an average of 1,000 visitors weekly. In addition, lectures, which average 24,100 yearly, are also held in Industrial Area. Islamic lectures have been well attended such as the one with prominent scholar Zakir Naik spoke on ‘Islam and Media: Peace or War’ in which a large audience of about 8,000 have attended. The centre also pays regular visits to prisoner, the sick, resident complexes, private companies, shops and malls. He said average visit to prisoners annually have increased to 200 times and 10, 300 in commercial shops. More and more young people are also participating in the centre’s activities, with 200 student volunteers who distribute booklets and brochures about Islam and the centre. Other means are employed to reach out to the most number of people such as using cars to distribute brochures to many parts of the country and participating in many events of global scale. Shawwal is the tenth month in the lunar calendar, as mentioned earlier. The first of Shawwal is Eidul Fitr. After the festivity of Eid it is recommended to observe six days of fast. This fast may be observed continuously non-break, or it may be observed one day at a time. 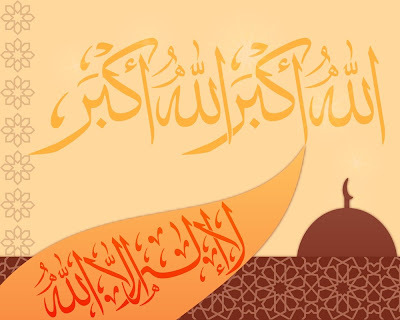 If you observe it continuously, you may start on the fourth day and end on the ninth of day Shawwal, or you may select days at random, provided you complete six days before the end of Shawwal. For instance, you may observe the third, fifth, seventh, ninth, 14th and 15th days. 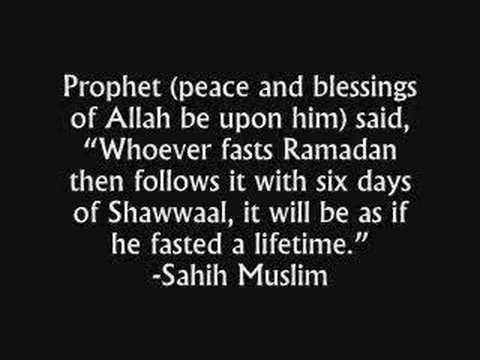 "Whoever observes the Ramadan fast and follows it with six days of fast in Shawwal, it is as if he has fasted Dahr (the whole year)." (Bukhari) It has been mentioned earlier that Dahr means the whole year. Possibly it may also mean forever, or for life. 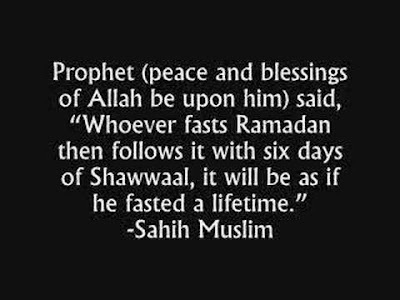 Analyzing this hadith, our jurists (`Ulama) explained how according to this hadith, a Muslim who fasts during Ramadan every year and follows it with six days fast of Shawwal, will be credited for fasting a whole lifetime. The Jurists correctly said: a good deed (hasanah) is rewarded a minimum of ten times its equivalent. It follows, then, that one Ramadan is equivalent to ten months of fasting, and the clincher, six days, is equal to two months, (6x10=60). That undoubtedly completes the year's twelve months. Thus, we see the wisdom and the reason why the Prophet (saas) mentioned six days after Ramadan in Shawwal, not five or seven. What is the difference between Rasool and Nabi ? After knowing the terminological meanings of Rasul and Nabi, it is also important to understand the difference of these two great positions. The Quran has used both the words, Nabi and Rasul, which shows that there were two kinds of messengers. Some of the messengers were Nabi only. Some messengers were both Nabi and Rasool. 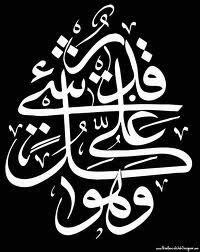 2: A Prophet is always a Nabi by birth, but a prophet become Rasul when he officially receives the post and declares it. For example, our Prophet Muhammad (sws) was Nabi by birth, but became Rasul when he officially got and delivered the message of Risalat at the age of 40.
awake but sees during sleep. Jis ne logon ka shukria ada na kia us ne Allah ka bi shukria ada na kia. Jab ghar se nikaltey waqt pardho to 70,000 farishty har taraf se apki hifazat karein ge. Jab ghar me dakhil hotey waqt pardho to apke ghar se mohtaji (ghurbat) door ho jaye gi. Jab wazu ke baad pardho to apke 70 darje buland hoon ge. Agar raat ko sotey waqt pardho to 1 farista saari raat apki hifazat kare ga.
Agar farz namaz ke baad parho to wafaat ke baad apka aik pauon zameen par or doosra jannat main hoga. Dunya me har waqt gonjney wali awaz"AZAAN" hai, Fajr ki azaan Indonesia se start hoti hai aur Behr-e-Aqyanos pohchney tak Indonesia me Zuhar ki Azaan ka waqt ho jata he. Kur'rah-e-arz per aik second bi aisa nahi guzarta jab Azaan nahi ho rahi ho. 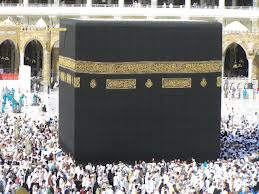 Jab kisi kaam ka pakka irrada kar lo to phir ALLAH pe bharosa rakho beshak ALLAH bharosa rakhne walo’n ko pasand karta hai. One of the narrators of a Hadith was asked about the manner in which forgiveness is to be sought, to which he answered: "The Messenger of Allah (sallallaahu ’alayhi wa sallam) used to say: ‘Astaghfirullah! Astaghfirullah! 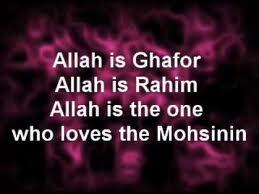 (I beseech Allah for forgiveness, I beseech Allah for forgiveness)’. Jis ne apni namazon ki fikar chordi ALLAH ne uski fikar chordi. Ya RAB UL ALAMEN ye kahan sy aaein? "teri bekhabri main logon ne teri Ghebat ki, yeh nekiyan un key ghebat karny ki wajah se tujhy mili hain.